Super Bowl Sunday’s always kind of a tough day for me. It doesn’t matter who’s playing; I feel like I lose. It means there’s no more football to watch. All of the football seasons – high school, college, pro, flag – are over. I mourn them every year at this time. Also, there are no more holidays to look forward to. That’s unpleasant. And there are no more excuses that allow me to gorge myself with food that my diet’s supposed to keep me from eating. That’s really unpleasant – it means I’m running out of excuses for not training better for that half-marathon I’m supposed to be getting ready for. Mayor Lee Leffingwell invited me to be part of his declaration that last Thursday was “Mack & Sally Brown Day” in Austin, Texas. It was great to spend some more time with the Browns, who’ve meant so much to the University of Texas, the City of Austin and the State of Texas. 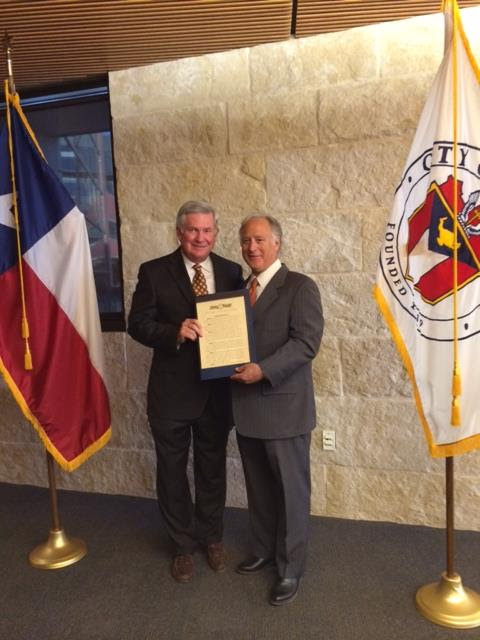 I presented the Coach with a proclamation from the Texas Senate thanking and recognizing him. It was a fun time – Coach Brown always makes events like this more fun with his great sense of humor and the way he embraces people. Yes, he publicly and appropriately teased me about my Baylor credentials. He also reminisced about how I was Austin Mayor when they came to Austin. He pointed out that I held a parade for them after that season. And, he noted, they only won 9 games. You can watch a nice clip of the ceremony here; Coach Brown starts speaking at the 8:02 mark. There’s one season, of course, that’s just now ramping up: election season. This marathon’s already going, and a lot of us who are on the ballot will be running (sometimes literally) all the way through Nov. 4. Here in Central Texas, the Travis County Democratic Party throws a party and fundraiser every other year to kick off the season. 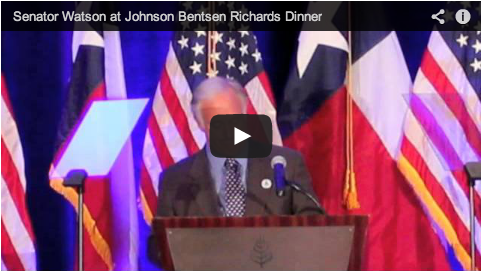 It’s known as the Johnson Bentsen Richards Dinner, honoring three great leaders, public servants and Texans: President Lyndon Baines Johnson, Senator Lloyd Bentsen and Governor Ann Richards. This year, we had a record turnout at the dinner. The featured speaker was another star Texas leader: Wendy Davis, our (just-about-certain) nominee this year to be Governor (you can watch her comments, as well as the remarks of Senator Leticia Van de Putte, our nearly certain Lieutenant Governor nominee, here). It was my pleasure to emcee the night and help introduce Senator Davis by saying a few words about Texas’ future and then calling up Wendy’s daughter, Amber, who in turn brought her mom to the podium. Because Texas can be even greater, but only if it elects leaders who actually will lead to that greatness. I look forward to talking more about all of these issues over the next few months. And I deeply, sincerely appreciate your support as we work to create an even greater Texas.